Albert Ayler - Prophecy. Vinyl LP. Bleep. ESP Disk continue their reissue spree with this slightly obscure gem in legendary free jazz player Albert Ayler’s back catalogue. 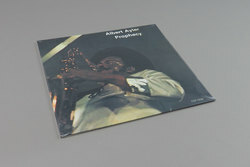 Perhaps not as accessible as Spirits or Bells, perhaps not as widely distributed as In Greenwich Village, Prophecy is one of the harder to find Ayler albums – but no longer! 43 years after its first run the world has access to mint copies once more. Two variations of Ghosts and an amazing performance of Spirits here, as well as ESP cohort Sonny Murray on percussion. Mal Waldron collaborator and prolific double bassist Gary Peacock also present!